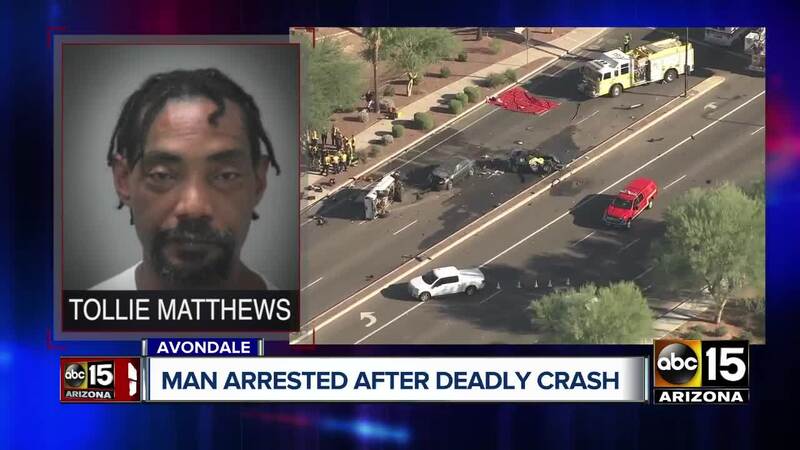 Avondale police have arrested a man after a four-vehicle crash on Thursday left a girl dead and three others injured. The crash happened Thursday afternoon near Dysart and Osborn roads. It is not clear how the crash happened. On Friday, Avondale police announced the arrest of Tollie Matthews, one of the drivers of one of the vehicles involved. He was booked into jail on counts of reckless manslaughter, aggravated assault, endangered and aggravated DUI, police said. The girl who died was identified by police as Amanda Moreno. Another person remains hospitalized in critical condition. Dennis Runyan, superintendent of the Agua Fria High School District, said in an email that additional guidance services were available to students at Agua Fria High School on Friday. "[Amanda] was a popular well liked senior so this comes as a sudden loss to so many who knew her," he said in an email. No information on memorial plans was immediately available.